R. Edison (Ed) Hill is a member/partner in the law firm of Hill, Peterson, Carper, Bee & Deitzler, PLLC. He founded this firm in June 1980. Mr. Hill is a trial attorney and spends his professional career exclusively representing individuals who have been seriously injured or families of those who have lost their lives as a result of others' negligence. EDUCATION: R. Edison Hill began his education at West Virginia University where he obtained a B.A. degree in biology in 1972. He went on to attend West Virginia University College of Law and obtained his law degree in 1976. PROFESSIONAL CAREER: Upon graduating from law school in 1976, Mr. Hill served as a law clerk to the Honorable K. K. Hall, Judge of the U. S. Circuit Court of Appeals, Fourth Circuit. Thereafter, he worked for a period of three years (1977-1980) as an associate for the law firm of Jackson, Kelly, Holt & O'Farrell in Charleston, West Virginia. 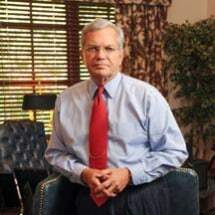 In June 1980, Mr. Hill founded his own law firm in Charleston, West Virginia, which firm evolved to Hill & Peterson in 1984, and then to the present firm (Hill, Peterson, Carper, Bee & Deitzler, PLLC) in 1991. PUBLIC SERVICE: R. Edison Hill currently serves as Chairman for the Central West Virginia Regional Airport Authority, which is the governing board for Yeager Airport, located in Charleston, West Virginia. He has served on the Yeager Airport Board of Directors since July 1993. PROFESSIONAL ORGANIZATIONS: Mr. Hill is a member of the following: American Association for Justice (Life Member); The National Trial Lawyers's Association (Member of Executive Committee since 2006); West Virginia Association for Justice (Served as President 1993-94); West Virginia State Bar; Kanawha County Bar Association; Lawyer-Pilots Bar Association; Southern Trial Lawyers Association; Consumer Attorneys of West Virginia; The Aletheia Institute and Association of Plaintiff Interstate Trucking Lawyers of America (Member of National Advisory Board 2011). Mr. Hill was selected into the RoundTable: America's 100 Most Influential Trial Lawyers, by the Trial Lawyer magazine. AWARDS: Awarded 2005 "Trial Lawyer of the Year" by Trial Lawyers for Public Justice for successful class action litigation in West Virginia in the case of Leach, et al. v E. I. du Pont de Nemours and Company, Circuit Court of Wood County, West Virginia, Civil Action No. 01-C-608, which case involved drinking water contaminated by the chemical ammonium perfluorooctanoate acid ("PFOA" or "C-8"), a chemical utilized in the manufacture of Teflon. DuPont paid $105 million to settle phase one of this litigation, with potential payout of an additional $235 million for medical monitoring. "Fellow" of the West Virginia Bar Foundation. Awarded 2008. Recipient of the “Clarence Darrow Award” at the Bellagio Hotel in Las Vegas, Nevada, October 9, 2014. The Darrow Award, named for famed attorney Clarence Darrow who may be best known for his role in the Scopes Monkey Trial in 1925 and depicted later by Spencer Tracy in the film Inherit the Wind, is given to attorneys who have demonstrated conviction in their work and exceptional courage in the face of adversity. The award is given out every year during the Mass Torts Made Possible Conference by Florida trial attorney and radio talk show host Mike Papantonio. PERSONAL INTERESTS: Mr. Hill is an aviation enthusiast and has held a private pilot's license since 1984. He is instrument rated and qualified to fly multi-engine aircraft. He currently operates a Beechcraft Baron and utilizes this aircraft for personal and professional traveling. As a lover of exotic plants, Mr. Hill enjoys growing a variety of orchids in his greenhouse. He is married and has three children and six grandchildren. Mr. Hill’s biographical information above includes reference to specific and cumulative case results of the past and should not be misconstrued as any indication that a future client or case will have a similar outcome. Case results depend on a variety of factors unique to each case. Past case results do not guarantee or predict a similar result in any future case undertaken by R. Edison Hill or this law firm.